It’s our brand new Petey Penguin Collection! He may look slightly familiar; however he is brand new with a new face, a lot more animated and a cute little name! This little “Petey” is doing a dance while his little red bird buddy looks on. He is very detailed and has just the right touch of glitter for that special sparkle. 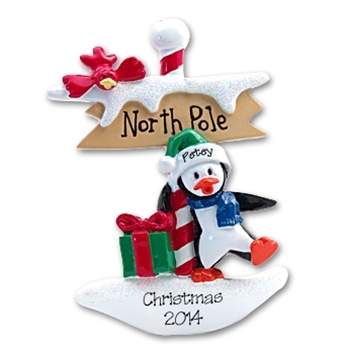 A great personalized gift for any child or adult that collects penguins. He is easily personalized but looks great without. Made from RESIN, hand painted and designed by Debi Allison. Petey comes complete with a hook and satin ribbon for hanging.